From left to right, BADDD Bois (Grayson Ayres and Eric Zishka, second), Easily Dug (Travis Core and Andrew Card, first), and Bolivia (David and Gustavo Gonzales, third) pose for a picture after Southeast Regionals. Don't have time to read the whole recap? Click here for a brief glimpse at the results. Note: This recap of the 2017 Southeast Regionals was written by Ezra Dantowitz. The last two Southeast Regionals featured some funky results. It might have been due to parity amongst teams or teams showing up on the biggest stage. Either way, it led to some great matches and unexpected results. Easily the biggest result of the day was Easily Dug (Andrew Card and Travis Core) taking home the Premier championship and doing it fairly easily. They dropped two games in pool play (15-13 to BADDD Bois and 21-20 to Unicorn Rampage), but in bracket play they rolled. Their only three game series was against Bolivia in the winners bracket finals, where they cruised in game one, then dropped game two before coming back strong in game three to go up 9-4 and eventually win 21-14. Their matches against RiseUpLights and Unicorn Rampage in winners quarterfinals and semifinals, respectively, were two games. Not to take anything away from Easily Dug, but Golden Set’s absence was certainly felt. With Harding Brumby called away for hurricane relief, Eric Zishka teamed up with Grayson Ayres - formerly of Artificial Flavors, but who has been a free agent in 2017. As BADDD Bois, they were a threat to take first and looked poised to do it after pool play. Down 13-11 against Easily Dug they held serve and then got three clutch breaks to take the game 15-13, finishing 8-0 in the morning. Meanwhile, Bolivia (David and Gustavo Gonzales) dropped more games than anticipated in pool play, giving them the 4 seed and putting them on an earlier than expected collision course with Zishka and Ayres. When they met in the winners semifinals Bolivia looked confident. Inconsistent serving from BADDD Bois proved to be costly as defensive breaks were hard to come by. In game three, Bolivia capitalized on BADDD Bois’s mistakes and played clean offense to take the game by a few breaks. This sent BADD Bois to the losers bracket where their first match was against Smells Like Teen Spirit (Forrest Boone and Matthew Martinez). Game one wasn’t close, but in game two SLTS was up a half break before BADDD Bois broke twice in-a-row to win 16-14. A photo of the Premier Division bracket from Southeast Regionals. In the other losers bracket quarter Spiker, No Spiking (Chris Moates and Skylar Shibayama) took out Unicorn Rampage (Ben Bunze and David Thole), securing a top 4 finish. SNS stayed close in both games against BADDD Bois, but couldn’t get breaks at the end. After taking the 8 seed in pool play and dropping game one against Daddy’s Crackers 21-19 (after leading 19-17), they proved they belonged in the top 4. They came back to beat Daddy’s Crackers only to get smacked by BADDD Bois. But in the losers bracket they secured quality wins over Cho’s Bros and then Unicorn Rampage to demonstrate they’re not to be taken lightly at Nationals. Both players have strong serves, but Moates, in particular, was able to generate a lot of power and wide angles with his 6’5” frame. When Zishka/Ayres met up with Bolivia again in the losers bracket finals it was all baddd news for Bolivia. Zishka and Ayres finally looked like they were clicking and took the series in two games to 15. This set up grand finals between Easily Dug and BADDD Bois. Game one was tight the whole way through. Down 18-19 Zishka served to Card who touched the net on his hit to tie the game at 19s. Core easily held, and then on game point Zishka hit the ball into the rim on two to give the game to Easily Dug 21-19. In game two Core’s serve took over and they took it - you guessed it - easily: 21-14. The whole tournament was an impressive display from Easily Dug, who burst onto the scene earlier this year at College Nationals. In April they knocked out Tyler and Cam Cisek before losing to Daniel McPartland and Mike White in finals to finish second. Their only other appearance at a Spikeball® Roundnet Association event this season was the Chicago Grand Slam. There they struggled with the sand and the wind in pool play and ended up with the 17 seed, which meant a round of 16 match against cisek_showalter (Tyler Cisek and Peter Jon Showalter). But in Atlanta they looked like they did at College Nationals. Core’s serves painted the side of the net and their athletic defense was unforgiving to anything short of perfect offense in bracket play. If they can keep this up - and I fully expect them to - they’ll be a scary team to play at Nationals in October. 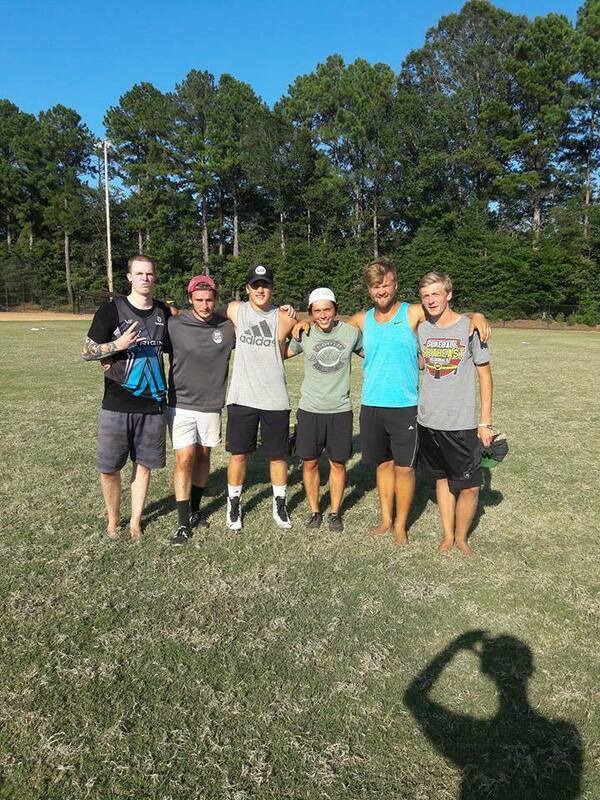 From left to right, Pizza Couch (Tyler Canciosi and Ryan Farlow, second), Bullcity Spikes (Anthony Daming and Juan Ruiz, first), and Kevin' Famous Chili (Derek Wheeler and Connor Harte, third) pose for a picture after the Advanced Division at Southeast Regionals. The Advanced Division ended with a slightly more predictable result. Favored in The Rally's Prediction Poll, Bullcity Spikes (Anthony Daming and Juan Ruiz) came up with the win. Formerly NC Spikes, they’ve been on the competitive scene for a while and it seemed like it was only a matter of time before they broke through and qualified for the Premier Division. After going undefeated in pool play and getting the 1 seed, they met their biggest challenge in YES (Ari Torres and Brady Paulk) in the round of 16. It took three games but they got through to face predicted second place finisher Cluck (Tucker Youngblood and Clark Marshall) in quarterfinals. Cluck finished pool play at 5-2 earning the 9 seed, which set up this earlier than anticipated matchup. 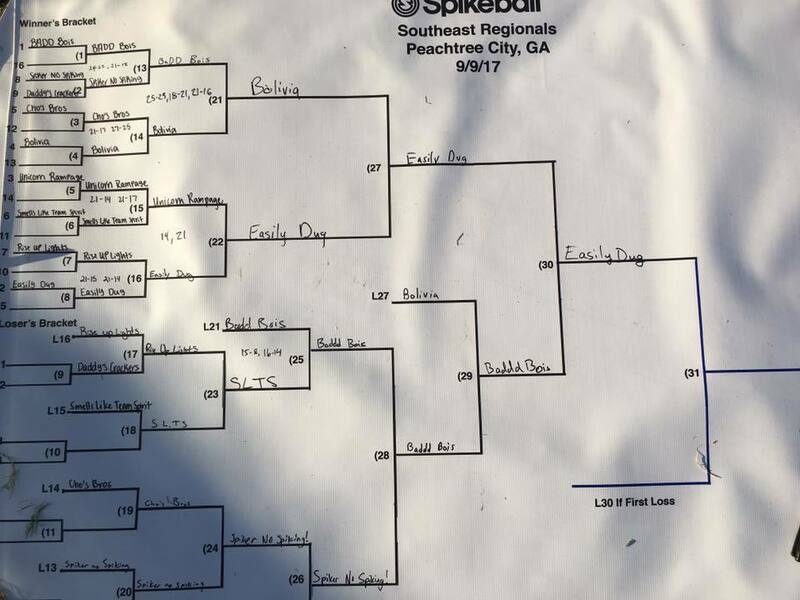 Bullcity won in two games and then got to face predicted third place finisher Kevin’s Famous Chili (Connor Harte and Derek Wheeler) in semifinals. The two teams practice frequently so it’s no surprise that it went three games, but again Bullcity took it. In the finals they looked comfortable as they beat Pizza Couch in two games. Who’s Pizza Couch? Great question. In my favorite story of the tournament Ryan Farlow (brother of Tori Farlow from veinte hamburguesas) showed up to the tournament to learn his blind date partner (Tyler Canciosi of Origin Roundnet) wasn’t there. Apparently, miscommunication on Facebook left Tyler thinking they were no longer planning on playing. By the time pool play was starting Ryan had reached Tyler and told him to come in time for bracket play. The two met for the first time around 12:30 p.m., just in time to get one pick up game in before starting off bracket play with the last seed (34 of 34). They easily eliminated the 31 seed, but then had to square off with the two seed, Spikachu (Bradley Thompson and Joseph Burchett). Thompson is Canciosi’s Origin Roundnet Club mate and knew this was not the draw they wanted after going 7-0 in pool play. Despite playing in just their second game together, Pizza Couch had the right combination of hard hitting and serves to beat Spikachu in two games to start their path to finals. They went on to beat veinte hamburguesas (Tori Farlow and Charissa Wright), Field the Burn (Jeremy Lutz and Ryan Field), and Flying Peacocks (John Littrell and Karry Nusbaum), before falling in the finals. Not bad for the 34 seed. Kevin’s Famous Chili beat Flying Peacocks (Karry Nussbaum and John Littrell) in the third place game to secure Premier Division qualification. Katie and Tripp Pierson pose for a picture after winning the Intermediate Division at Southeast Regionals. Easily everyone’s favorite father-daughter team came up big on Saturday. Playing in their seventh tournament and second official event of the summer, ‘Merica (Katie and Tripp Pierson) came through with the win. They took the 1 seed in pool play and battled through three-game series in both semifinals and finals to take first place. Only three women teams came out on Saturday, and, as expected, veinte hamburguesas won. Second place went to Not Twins (Ali Jenkins and Olivia Jenkins). Like a Girl (Paige Carver and Peazy Ruiz) came in third. This was the first podium for Travis Core in only his second official Spikeball® Roundnet Association event (the other being Chicago). The winners bracket finals between Easily Dug and Bolivia was Core’s first three game series. It was also one of the more lopsided three game series you’ll ever see. Easily Dug won games one and three easily (21-16 and 21-14). Easily Dug led 19-18 in game two, but Bolivia held and then Gus rattled off two strong serves to steal the game. Easily Dug beating Bolivia was Andrew Card’s first bracket win over a top 10 ranked team. 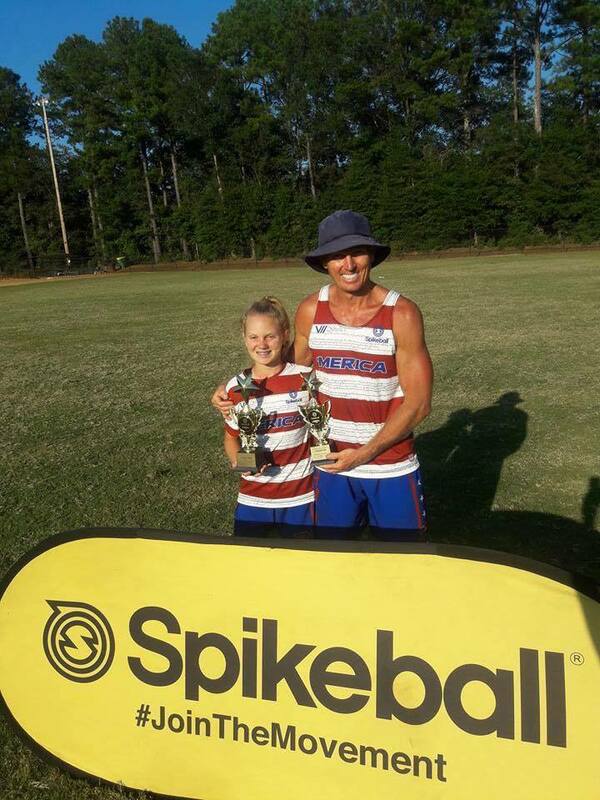 Grayson Ayres got his best career official Spikeball® Roundnet Association event finish at second place. 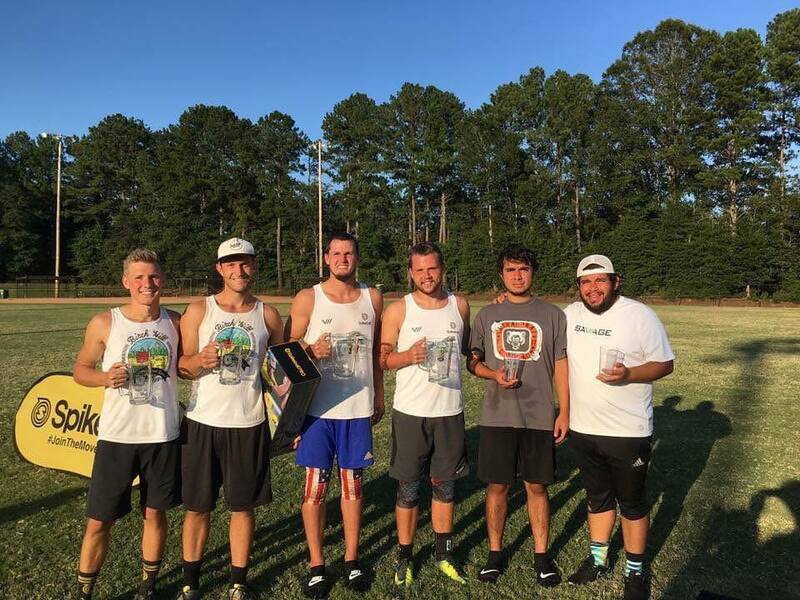 For the third consecutive year, Bolivia finished in third at Southeast Regionals. Three premier players were in the Advanced Division field. They finished fourth (Karry Nussbaum), t-17th (Bradley Thompson), and t-17th (Dakota White). Spiker, No Spiking has played four official Spikeball® Roundnet Association tournaments this year. Their results: t-9th at San Francisco Advanced Division, second at Dallas Advanced Division, t-17th at SummerSpike Premier Division, and now fourth at Southeast Regionals Premier Division. That’s pretty steady improvement over the course of the season. My favorite moment in the tournament came in the finals when Easily Dug was looking for a break. Got something related to roundnet that you want to know more about? Want to get involved writing previews or recaps for tournaments near you? Contact Anthony Rentsch at anthony.rentsch@gmail.com or @Anthony_Rentsch on Twitter. Follow USASpikeball on Twitter and Instagram! Subscribe here to receive email notification for all posts on The Rally Blog!